– If you have a long memory for short-lived things, then you remember that in 2007 Giro released a footwear line. Unlike helmets (and later glasses), Giro wasn’t actually manufacturing these shoes, but rather it was a licensing deal through an outfit called TRG Group. To call it a disaster would be the honest truth: The arrangement was dissolved after one brief-yet-eternal year. Which is why it’s pretty interesting to see what’s been on Levi Leipheimer’s feet during the Tour. A sign of a shoe resurrection at Giro? – Our Maillot Panache Virtuel jersey is shuffling amongst a worthy cast of characters: Cadel Evans, Mark Renshaw, and Alexander Vinokourov. Why Cadel? Because in his devastating will to perform throughout 2010 he’s shed his longtime whiny nancy-boy persona -- the essence of his nickname ‘Cuddles.’ What was once an off-putting vibe is now one of Warrior King -- and with that, you’ll never hear us refer to him ‘Cuddles’ again. Lemond won the Tour in ’90 in his arc en ciel jersey. Boonen won the Ronde in ’06 in his. But it hasn’t been since the Merckx era that a World Champion has shown up every day to every race with Evans’ appetite for destruction. Mark Renshaw should’ve come to the attention of world long before the injustice of his Stage 11 disqualification. He’s the fastest rider in the world whose job isn’t to win races. Much ink has been spilled discussing his DQ -- polarized opinions best summarized as BSNYC vs. Gerard Vroomen. Now that the dust has settled, it’s safe to see the final 600 meters of Stage 11 for what it really was: A litmus test of what you think about Team Garm*n. If you dig ’em, then you think Renshaw’s DQ was justified. If argyle makes you cringe, then you think the DQ was overreaction. 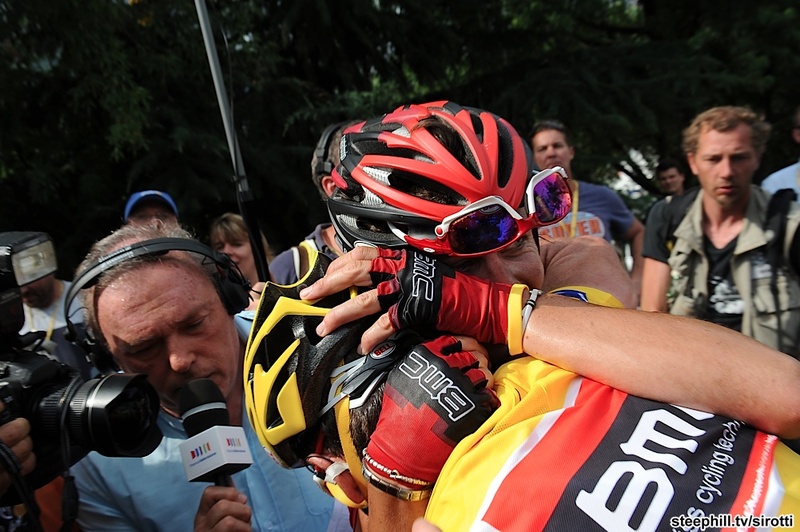 Except for the fact that Bradley Wiggins in languishing in 18th place, Garm*n’s biggest (and only) victory in le Tour 2010 has been Renshaw’s DQ’ing -- a team performance that falls short of even the most pessimistic predictions. And Vino? You can’t beat the Cozy Beehive’s thoughtful summary of Vino’s long journey. And for those with a nose for history & bikes, this one’s for you. Come August he’s up for the 2nd biggest fight of his life, and no doubt loads of Armstrong’s energy is being devoured by worry and whatever preparation he can orchestrate from France. And even though they pant and swoon and purport to bring insight about his every move, why can’t the Versus crew acknowledge the legal black cloud hanging over Armstrong? Have Phil or Paul or Craig or Bob said the phrase ‘Grand Jury’ even once? It’s like watching a World Cup game in North Korea, except that it’s brought to you by Road ID. – The only thing worse than watching the Versus TV coverage of the Tour here in the US? It’s having to watch it in Canada where all you get is the live broadcast. – Best underpublicized factoid about l’affaire Armstrong? It relates to former President of the UCI, Hein Verbruggen, now notoriously accused of taking a $100,000-ish bribe from Armstrong to suppress evidence of his purported positive-for-EPO blood test in the ’99 Tour. Did you know Verbruggen has a track record for taking bribes? BIG ones, if you’re to believe the BBC, i.e. Armstrong’s bribe is between-the-couch-cushion size by comparison. 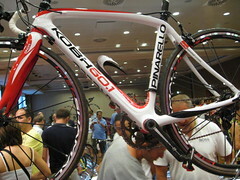 – A quick dispatch from Treviso, Italy, where we attended the launch of Pinarello 2011 this weekend. See our massive photo dump here. (1) We got our hands on the all-new Campagnolo 11. Yes, after just 1 year Super Record, Record, and Chorus are all being revamped, with the cassette being the only unchanged component. Highlights: The Super Record crankset gets a Ti spindle. The rear derailleur is full carbon. Throughout the Campy 11 line the shifting gets fine-tuned, most notably through its shorter throw for gear engagement (most noticeable on the front shifter.) Also, graphic changes (a lot more red) throughout. Some lousy light snapshots here. (2) No changes to the Dogma except paint/decals, and the fact that we’ll now offer 2 new sizes -- 42cm and 62cm. (3) Some added options for the Kobh are coming. 2 new (i.e. non-Team Sky) colors will be introduced come Interbike time. Also, you’ll get a 2nd fork option -- you can get a taller axle-to-crown and increased rake (50mm vs. the current 47cm) for increased stability & vibration-absorption on pavé. (4) You’ll see an all-new Paris Carbon for 2011. Think of it as a lower-priced replica of the Dogma Carbon. It’ll be a fully asymmetrical design with slightly-less exotic carbon to save dough. It’ll run about $2000 less for a frameset than the Dogma. (5) A new TT bike called the Graal replaces the Montello. It has a scalloped downtube with aero tubes throughout (and a Di2-specific option where the battery resides in the chainstay.) Same carbon as the Dogma and asymmetrical like the Dogma. It comes with a dual-post front brake positioned behing the fork. Seatpost options give you anywhere from a 76-80 degree seat angle.